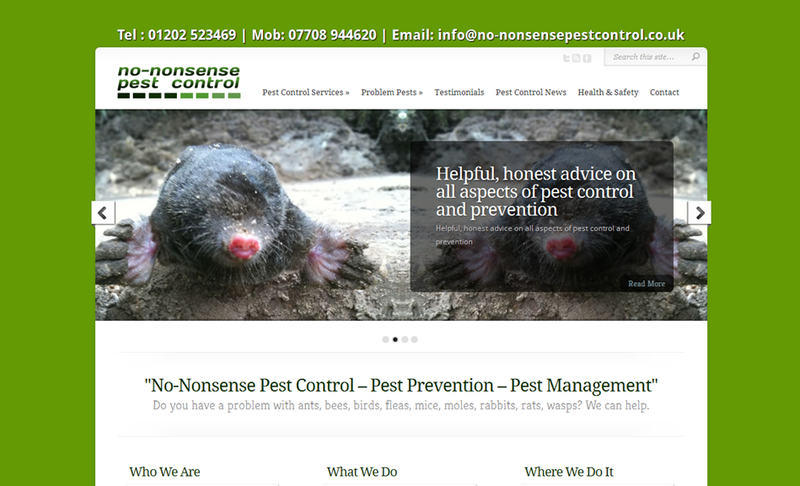 No-Nonsense Pest Control are pest controllers based in Bournemouth, Dorset. The business is run by Steven Joy (RSPH Level 2) and covers the Dorset and West Hampshire area. Steven already had a WordPress website, but it was not performing well in search engines and also not attractive to customers due to its colours and layout. M35 Web Design took the content from the old website and put a new WordPress template in place. The navigation menu was changed to make the site more user-friendly. M35 Web Design wrote new content, which was added into the existing editorial and some new pages were also created. The new version of the site went live at the beginning of 2012, and has achieved great rankings in search engines. The client now adds most of the content himself.